A while back, my wife and I started frequenting a nearby farmers’ market. I don’t think I’ve mentioned it yet, but my wife’s in school studying to get her Master’s in nutrition. As a result, she’s become addicted to obsessed with very passionate about healthy living and eating, which is the reason for us going to the farmers’ market. She wants to make sure that we’re eating fresh, organic vegetables from a source she can trust. The first few times we went, I was just there to keep her company. I really didn’t have any interest in the rainbow chard, kale, brussel sprouts, and beets that my wife was getting so excited about. Then, on one of our outings, I saw it. It was like an oasis of deliciousness in the middle of a desert of healthiness. Hmmm…maybe not the best example. A beacon of tasty light in a sea of…ah forget it. Anyway, a local food truck, Yumé Burger, started showing up to our farmers’ market and took the place of their sister truck, the peached tortilla, which is also wonderfully amazing by the way. So one Saturday as my wife was gathering her “garden of goodness” as she likes to call it, I wandered over to the truck to see what it was all about. Who am I kidding? I wandered over to the truck in hopes that my wife would come looking for me and then offer to buy me a burger :). And thankfully, that’s exactly what happened. That’s my miniature schnauzer, Kona. He was a lil disappointed when I wasn’t willing to share any of my Japajam. 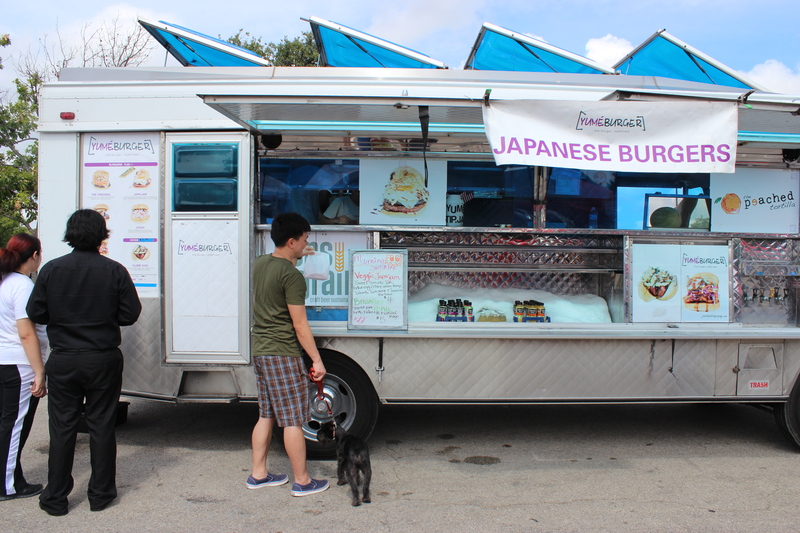 Yumé Burger offers 5 Japanese style burgers as well as their Yumé dog. I was torn between The Original (all beef hamburger, american cheese, tomato, jalapeno-onion relish, and pink sauce) and the Po-Ku (all beef hamburger, seared pork belly strip, creamy wasabi slaw, and Japanese pickles), but ultimately ended up getting the Japajam after my wife overheard the girl taking orders say that it was their top-seller. Yeah…I’m a sucker for those kinds of statements. “New and improved”, “fan favorite”, “now with 33% more”…yup. They get me every time. However, I was not led astray on this occasion. 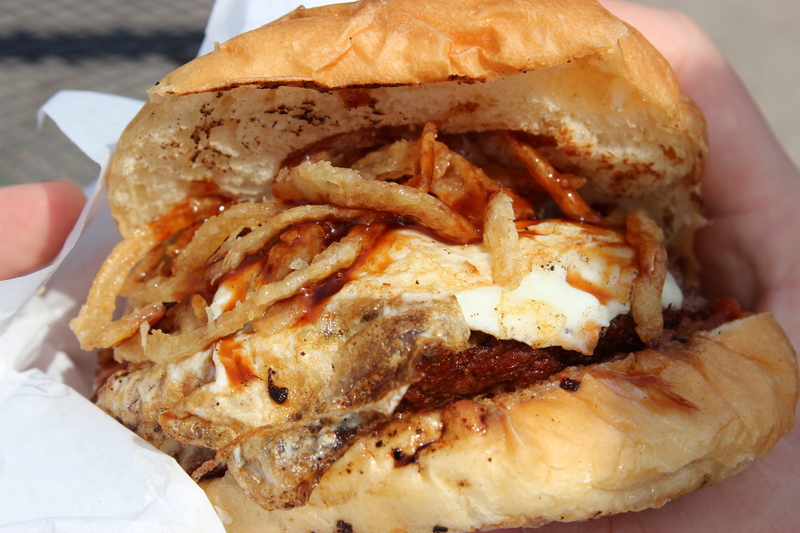 The Japajam is an all beef hamburger with Japanese tomato jam, jalapeno jack cheese, Japanese BBQ sauce, crispy onion strings, and a fried egg. Served in a perfectly toasted bun, this burger was unlike any other I’d had before. You could just tell that the burger had been deftly assembled, that the person responsible for my burger was incredibly skilled and talented. Onion strings AND a fried egg?? Yum!! Luckily I didn’t have to eat this burger standing up or I probably would’ve ended up with egg yolk all over me (multiple napkins were necessary for the Japajam). All this being said, I must note that the burger was on the sweet side. But I’ve noticed that this tends to be the case with many American and European foods that are reinterpreted by Asian cultures. For example, pizza places in Korea will add a sort of sweet potato mash along their crusts to appeal to the palates of the locals. I’m not the biggest of fan of the sweet-savory combo, but it worked on the Japajam.